Initial D World - Discussion Board / Forums -> Initial D's successor? 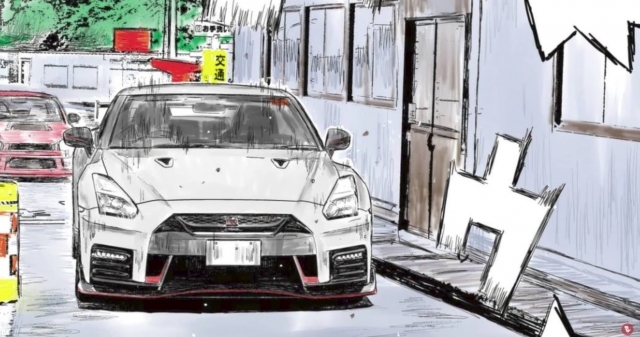 Four years after the conclusion of Initial D, author Shuichi Shigeno has embarked on the development of a new racing manga. The first chapter of the series, called MF Ghost, has kicked off in Japan’s Weekly Young Magazine, where Initial D began its 18 year run in 1995. While it has a new cast of characters and is set many years after Takumi Fujiwara’s famed panda AE86 raced its last race, there seems to be at least one character carried over from Initial D.
MF Ghost takes place some time in the 2020s when most vehicles on the road have become autonomous, reducing accidents by 87 percent, and traditional cars are all but extinct. Perhaps an ideal world for some, but this petrolhead dystopia sounds scarily similar to what the entire auto industry is efforting towards these days. In this world, a sanctioned series of races called MFG in Japan are the among last bastions of human-driven cars. The first one introduced takes place on a 40km stretch of the Hakone Touge, one of the birthplaces of underground drifting in the 1980s. Kanata is of course looking for a car to race with, and wouldn’t you know it, it’s a Toyota 86. But, instead of a classic AE86, the silhouette of the car reveals that it’s a newer Toyota 86, known until recently in the US as the Scion FR-S.
Here’s where it gets intersting for Initial D fans. The mechanic that shows him the car mentions a racing genius that oversees the MFG, a man by the name of Ryo Takahashi. That, of course, seems like the shortened name of Ryosuke Takhashi, the driver of the white Mazda FC3S RX-7 in Initial D, one of Takumi’s most fearsome rivals and later his team manager. The creator of the video above seems to think it’s pretty likely Ryo is the same character. Whether MF Ghost‘s Ryo Takahashi will play a more important role or is simply mentioned in an off-hand comment is unknown, but hey, it’s only chapter one. Image size reduced, original size: 1127 x 1600. Click here to view the image in its original dimension. I've started reading this manga thanks to this thread! So far it is a lot more enjoyable than the other stupid Shigeno manga about an older mangaka and a young girl. I've just read 7 chapters, but I like it despite its flaws. Guess I am that thirsty for anything Initial D related. I like the sci-fi fantasy aspect with the obsolete racing cars in a futurist world of drone cars. 1-The MFG series have 30 million Pay-Per-View buyers. A decent UFC only has 500 000 PPV sales. This makes MFG MUCH MORE profitable than even Formula One. Yet despite all this money, the drivers are "mostly amateurs and old geezers" (quoted from Michel one of the pros from chapter 3), with only a few pros. That doesn't make sense. With that much money on the line, TOP TALENT pros would flock to this series and the 10 billion Yen first prize. 2-Angel 7 is a lame character. I hope her mystery will change my mind. The main character's last name is Katagiri. There was a Racing Team Katagiri with Kai and Minagawa in Stage 5. I wonder if there is a relation. I do remember Takumi driving Iketani's S13 VERY fast on the first try, but this is on a whole different level really.